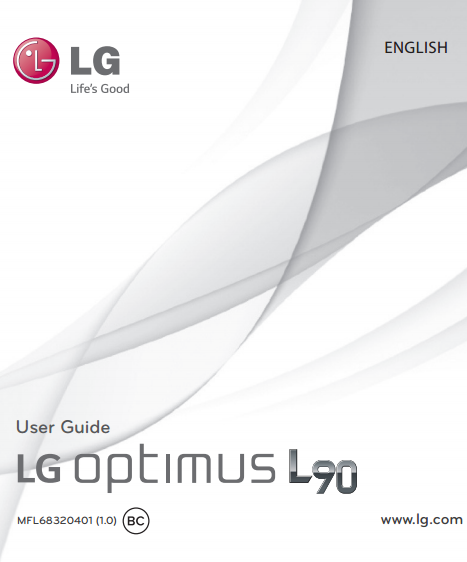 The LG Optimus L90 D415 Manual aka user guide is available now. The manual consist of 122 pages with file size of 5.5 MB. It's support in english language and devided into 21 section. The LG Optimus L90 D415 is powered by 1.2 GHz quad core processor (Qualcomm Snapdragon S4 MSM8226). It's run on Android 4.4 Kitkat operating system. It has 4.7 inches IPS LCD capacitive touchscreen. This smartphone 5 MP rear facing camera and 1.3 megapixel front facing camera. There are 8 GB internal memory, 1 GB of RAM and support external memory up to 32 GB. The LG Optimus L90 D415 user manual contains reference information such as phone layout, Installing the Micro SIM card and battery, Inserting a microSD card, Formatting the microSD card, Locking and unlocking the screen, Using Hard Reset (Factory Reset), Installing an Open Source Operating System, using home screen, Connecting to Wi-Fi networks, USB tethering, using bluetooth, Smartphone Mobile Hotspots, making a call, using contacts and messages, using camera and camcoder, Recording a quick video, Using QuickRemote, T-Mobile TV, ThinkFree Viewer, LG Backup, Restoring smartphone data. Then about using browser, Google+, Access the Settings menu, LG Mobile Phone Software update, troubleshooting problem, safety and more.